I was fired and would like to pursue a claim for disability discrimination. Should I try to find another job? Yes. If you plan to pursue any type of legal action against your former employer, you have a duty to mitigate your damages. What does a “duty to mitigate my damages” mean? Mitigation is a legal concept that requires you (like all plaintiffs) to reduce the amount of money that you lost as a result of your termination. This means that you have an obligation to make a reasonable and good faith effort to (1) find another job and (2) accept a job offer for a substantially similar position. What if I don’t mitigate my damages? In your ADA case, you will be asking the court to award you lost wages in the form of back pay (amount of money that you would have earned from the time of your termination until the date of the judgment or settlement) and sometimes front pay (amount of money that you would have earned from the date of the judgment or settlement into some point in the future). If you do not try to mitigate your damages, then your lost wages may be eliminated or reduced, even if you otherwise win your case. This is why it is so important to try to find another job. What if I cannot find another job? Can I still collect my lost wages? Yes. There is no obligation to succeed—just to make reasonable efforts. If you diligently search for a comparable job and do not unreasonably decline an offer for a comparable job, you will not be penalized if you cannot find a job. What if I do mitigate my damages? How will this impact my recovery? If you do mitigate your damages, your new earnings are deducted from your lost wages. Example. If you earned $50,000 a year and are out of work for three years before your case is decided, you will seek $150,000 in back pay. That seems unfair. Why do my damages decrease if I find another job? While it may seem unfair, the stated reason for this rule is that even if your employer did something wrong in firing you, it should not have to pay you to “do nothing” and wait to collect from the lawsuit if you could be working. The requirement to mitigate your damages is not unique to employment cases. No. You don’t need to accept a job that pays significantly less than your former position, or one that is not substantially similar. However, you should carefully consider your options before you turn down a job that is comparable to your former one, even if it is not exactly what you were hoping for in terms of work or pay. Can I mitigate my damages by starting my own business or going to school? Maybe. If you are considering mitigating your damages by going to school or starting your own business, you may want to consult with an employment attorney to make sure that you are protecting yourself. Is it guaranteed that my damages will be reduced or eliminated if I don’t mitigate my damages? Not necessarily. It is the employer’s burden to prove that you did not mitigate your damages. However, you will be in a much stronger position if you can affirmatively demonstrate your efforts to find another comparable job. What should I do to prove that I mitigated my damages? Keep a job search log to document your mitigation efforts. During your lawsuit, you will be asked what you did to try to find another job. Keep copies of your job search documents, including applications, emails with prospective employers, cover letters, resumes, etc. I have a good memory. 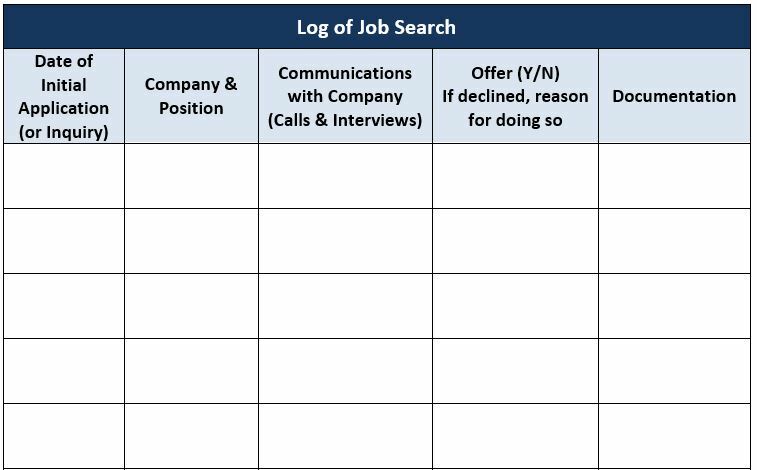 Do I still need to keep a job search log? Yes. Remember that lawsuits take time, so it may be a few years before you have to answer questions about the details of your job search. If you keep a log, you will be able to remember all the effort that you took and the details about each position. How should I log my efforts? There is no one-size-fits-all method of documentation. The key is to keep your documentation in one place, and use a system that fits easily into your lifestyle. Some people find it easier to use a hard copy journal, calendar or planner while others prefer to document their efforts on a computer file. You may also wish to use the template that we have included at the end of this Fact Sheet. I am already reporting information about my job search to the unemployment insurance office. Can I just use this report? Yes, so long as you (1) keep a copy of this report so that you can easily access it in the future; and (2) it includes all of your efforts. What should I include in my log? Include date of your initial application, letter or inquiry; company you applied to; position applied for; all communications with the company (including interviews and calls); whether you received an offer and if you declined it, why you did so; and whether you have documentation about the application. 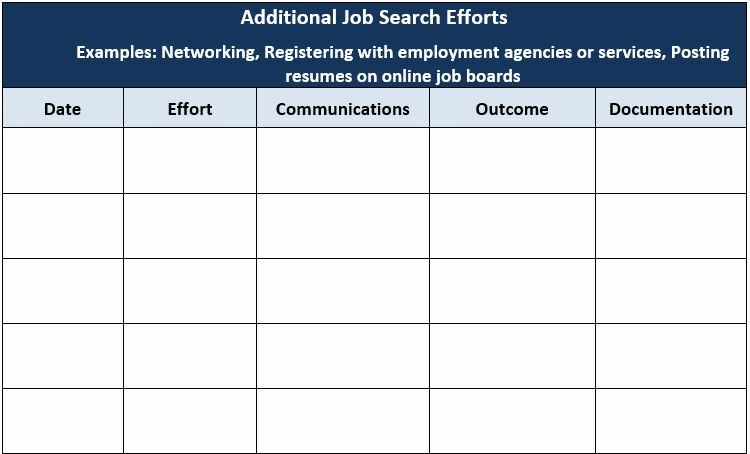 Additional Job Search Efforts: This is your log of all other job search efforts including networking, registering with employment agencies or services, posting resumes on online job boards, etc. Include date of effort; type of effort; communications; outcome; and whether you have documentation. What shouldn’t I include in my log? Remember that in a lawsuit, you will be required to produce a copy of your log. For this reason, it is extremely important that you are completely truthful in your log. It is also important that you are careful about what you write as a judge or jury might read the information in your log. This resource material is intended as a guide for people with disabilities. Nothing written here shall be understood to be legal advice. For specific legal advice, an attorney should be consulted. Equip for Equality, an independent nonprofit organization, is the Illinois state Protection & Advocacy System whose mission is to advance the human and civil rights of children and adults with disabilities. The Employment Rights Helpline seeks to empower individuals with disabilities to advocate effectively. This publication is made possible by funding support from The Chicago Community Trust, the U.S. Department of Health and Human Services, the Administration on Intellectual and Developmental Disabilities and the Center for Mental Health Services of the Substance Abuse and Mental Health Services Administration; the U.S. Department of Education, Rehabilitation Services Administration; and the Social Security Administration. The contents of this publication are solely the responsibility of Equip for Equality and do not necessarily represent the official views of any of these agencies.